wine, impromptu jaunts, dressing up, dressing down, naps! You time and your rules. drop of water dances across the skillet then you are good to go! into the dry while gently stirring until just combined. Do not over-stir. until the other side is golden as well and the pancakes are cooked through. syrup you like, or fruits, or compote, or vanilla bean ice cream! cake) but are nice surprises when dotting your pancake. can sometimes get when drenched in syrup. These look really good. Made me yearn for fluffy soft pancakes all so suddenly. And I am nowhere near a good pancake place. Arrrrrgh. The last time I ate a pancake was when my relatives from dallas gave us boxes of buttermilk pancake mix. i didn't like it at all! hahaha since then I just order pancakes from jollibee or mcdo if i'm craving for it. but this recipe looks nice. is it possible to use only all purpose for this? My bf and I love pancakes anytine of the day even dinner. Thanks for the recipe. 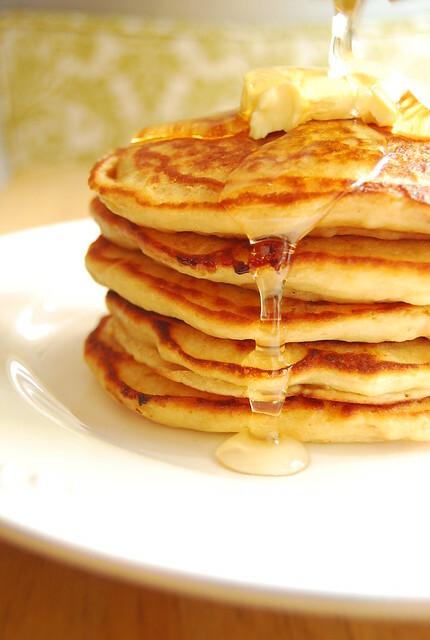 Oh yum, love the healthier take on pancakes…beautiful picture…the weekend has passed but I am craving big time now!! I haven't had pancakes in ages, so reading this particular post makes me want to run down to the nearest Pancake House to get a midday flapjack fix! We call these hotcakes…and I love them. A popular breakfast in house, especially when the boys lived at home. Mmmhhh, those look just irresistible! Those pancakes look divine! Love maple syrup in pancakes! And that photo is just mouth-watering! Seriously! I have just started to make this kind of pancakes this past year and I love this version, I'm bookmarking this for next pancake batch! There's nothing i like more for breakfast than pancakes. I just happened to find your blog. I can eat breakfast for every meal! Pancakes are my favorirte. I must confess, I had the prepackaged frozen Walmart pancakes this morning. I know, cheating. More like lazy! I think tomorrow morning I'll treat everyone to this recipe! Thanks! I love weekends..and pancakes are the best way to enjoy it! Looks delicious. Hi Love cooking! I also buy the package mix sometimes…but I’m experimenting so one day I won’ have to! Hi Amy! And bacon…that’s the only thing missing here! I love pancakes for breakfast but buttermilk can be so filling and bad for you too lol these multigrain look delicious and just as fluffy and are a healthier option! Great post!